In Buckley v. Valeo (1976), and again in Federal Election Commission v. Massachusetts Citizens for Life (1986), the Supreme Court held that the regulatory requirements of operating a political action committee could not be imposed on groups that lacked the primary purpose of supporting or defeating political candidates in elections. But across the country, states are flouting that command, imposing rigid requirements on ordinary citizens who are trying to express their political opinions. In Colorado, for example, a group of friends calling themselves the Coalition for Secular Government operate a website on which they posted a long policy paper on abortion and church-state relations. The paper concluded by urging Coloradans to vote “no” on a ballot measure. For that, the state says they must register as a political committee and report their activities, income and expenses. The article begins with an even more egregious case than ours, and it’s well worth reading. This press release from the Center for Competitive Politics — Colorado Supreme Court to Rule on Federal Judge’s Questions — is awesome, awesome news for the Coalition for Secular Government’s challenge to Colorado’s campaign finance laws. In an order received today, the Colorado Supreme Court agreed to a US District Court judge’s request to “provide clear guidance… as to the scope and meaning” of four unclear provisions of Colorado’s campaign finance laws that are the subject of litigation under the First Amendment to the US Constitution. The lawsuit challenges whether Colorado can force small educational groups to register with the state before expressing an opinion on or publishing an analysis of a ballot question. Because of vague state laws, confusion as to what constitutes political speech and what is covered under a press exemption, and a refusal by the state to abide by a federal court order, CSG has found it nearly impossible to carry out the activities of a small non-profit group without fear of running afoul of complex Colorado campaign finance laws. Judge Kane certified four questions, which the Colorado Supreme Court has now agreed to answer. The questions are as follows: 1. Is the policy paper published by the Coalition for Secular Government (CSG) in 2010 “express advocacy” under Art. XXVIII, S 2(8)(a) of the Colorado Constitution? 2. If the policy paper is express advocacy, does it qualify for the press exemption found at Art. XXVIII, S 2(8)(b)? 3. Is the policy paper a “written or broadcast communication” under S 1-45- 103(12)(b)(II)(B), C.R.S.? If not, did it become a “written or broadcast communication” when it was posted to CSG’s blog or Facebook page? 4. In light of Sampson v. Buescher, 625 F.3d 1247 (10th Cir. 2010), what is the monetary trigger for Issue Committee status under Art. XXVIII S 2(10)(a)(II) of the Colorado Constitution? A copy of the court order is available here. The case, over which Judge Kane presides, is Coalition for Secular Government v. Gessler, No. 12-cv-1708. The plaintiff’s brief to the Colorado Supreme Court is due December 3, 2012. Once again, I cannot properly express my gratitude to Allen Dickerson and the rest of the staff at the Center for Competitive Politics for this legal challenge to Colorado’s campaign finance laws. I’m not just grateful for the hope that I’ll never have to file campaign finance reports again — nor even for the hope of striking a solid blow for free speech in Colorado. I’m grateful because my participation in this case has enabled me to see that the rule of law, while not perfect, is a robust institution in America. As a result, I’ve become far more optimistic about the future over the past few months. I don’t share the post-election “Doom and Death Camps” so prevalent among advocates of free markets, for reasons that I explained in Sunday’s Radio Show. I’m glad of that, and I’m proud of that. So if you’d like to assist in the efforts of the Center for Competitive Politics, you can donate here. Judge Kane’s order was made in connection with a case brought by the Center for Competitive Politics (CCP) on behalf of the Coalition for Secular Government (CSG). The case, over which Judge Kane presides, is Coalition for Secular Government v. Gessler, No. 12-cv-1708. CSG alleges that, even though it plans to raise no more than $3,500–nearly all of which will go toward updating and disseminating a public policy paper–the state constitution appears to demand that CSG register as an issue committee if its papers take a position on ballot measures. Such registration would force CSG to maintain several new types of records, file periodic reports, turn over the names and addresses of contributors who donate as little as $20 toward financing the policy paper, and risk substantial fines should it err in its public filings. Does the Colorado Constitution treat money spent on a policy paper, including one that suggests how the reader should vote on a ballot initiative, as the equivalent of money spent on political ads? Does the state constitution entitle policy papers distributed over the internet to be treated in the same way as newspaper and magazine editorials for purposes of campaign finance law? In light of a federal decision declaring certain groups too small to be regulated by the state of Colorado, what is the monetary trigger for an issue committee under the state constitution? Is it the roughly-$1,000 mentioned in the federal opinion? The $3,500 contemplated by CSG? The $200 mentioned in the constitution itself? Or another number altogether? While the Colorado Supreme Court is not required to answer Judge Kane’s questions, doing so would provide some welcome guidance on these important questions. Judge Kane’s order, which includes a brief description of the case, may be found here. 1. Is the policy paper published by the Coalition for Secular Government (CSG) in 2010 “express advocacy” under Art. XXVIII, S 2(8)(a) of the Colorado Constitution? 3. Is the policy paper a “written or broadcast communication” under S 1-45-103(12)(b)(II)(B), C.R.S.? If not, did it become a “written or broadcast communication” when it was posted to CSG’s blog or Facebook page? 4. In light of Sampson v. Buescher, 625 F.3d 1247 (10th Cir. 2010), what is the monetary trigger for Issue Committee status under Art. XXVIII S2(10)(a)(II) of the Colorado Constitution? I’ll be very interested to see how the Colorado Supreme Court rules on these questions — and then what Judge Kane says about that. I’m excited by the prospect of at least clarifying Colorado campaign finance law, let alone striking down some of its most burdensome elements. Also, I’ll have some news about the forthcoming updates to Ari Armstrong’s and my 2010 paper — The “Personhood” Movement Is Anti-Life — soon. Although “personhood” won’t be on the ballot in Colorado due insufficient signatures, the movement has grown dramatically in influence over the past year, as seen in the GOP primary. Hence, Ari and I are determined to update the policy paper to reflect that. Alas, my being so sick last week blew apart our plans. We’ve made a new plan, and it’s a better plan, I think. You can expect some announcements about that later this week. Just know that, once again, we will need your support to make it happen! Plaintiff’s requests for preliminary and permanent injunctive relief were consolidated and are set for a full-day trial/hearing tomorrow, Friday, September 21, 2012. Given the unlikelihood proponents of a ‘personhood’ amendment will salvaged for the Colorado state ballot in time for the 2012 election cycle, the impetus for the very expedited timeframe under which this case has been operating has relaxed enough to warrant the more thorough approach afforded by certifying certain important and threshold questions to the Colorado Supreme Court. Accordingly, tomorrow’s hearing is VACATED, to be reset at a later date. That’s good news, on two counts. First, the proposed “personhood” amendment will surely not make the ballot in 2012. If adequate numbers of signatures were indeed collected, the remedy will be that the measure appears automatically on the 2014 ballot. Hence, Ari Armstrong and I can raise and spend money for an updated version of our 2010 paper on the “personhood” movement without me filing those burdensome and intrusive campaign finance reports. Given the prominence of “personhood” in the GOP primary and Paul Ryan’s support “personhood,” I’m eager to update that policy paper. I’ll be announcing more about that soon. Second, by not being on such a rushed schedule — and by having the Colorado Supreme Court answer some critical questions in advance — the case is likely to grapple in a more serious way with the serious constitutional questions raised by the suit. Obviously, that’s good news. For a taste of the other work of the Center for Competitive Politics, see this Washington Examiner column by Allen Dickerson and Bradley Smith: Court ruling a boon to privacy, accuracy. If you’d like to donate to their efforts, you can do so here. The Coalition for Secular Government’s case challenging Colorado’s campaign finance laws will be heard in Federal Court tomorrow. The courtroom is open to the public. So if you’d like to attend, you’re welcome to do so. The case will start at 9:30 am, and it will likely last the day. It will be held in the Alfred A. Arraj United States Courthouse (901 19th St. in Denver). It’s being heard by Judge Kane in Room A802. I’m really excited by the potential of this case. I’m a bit nervous too, as I’ve never testified in court before. Happily, my job is simple: I just need to tell the truth about CSG, and leave the heavy lifting of the legal arguments to my fabulous attorney from the Center for Competitive Politics. Update: Never mind! The trial has been postponed for complicated (but good) reasons that I’ll explain later. Personhood 2012: Ballot or No Ballot? The Colorado secretary of state’s office said Tuesday the proposed anti-abortion “personhood” amendment will not be on the 2012 ballot — no matter the outcome of proponents’ planned legal action to prove they collected enough voter signatures. The ballot certification deadline was Monday. Even if a judge rules personhood sponsors’ petition was sufficient, the measure would have to wait for the 2014 general election, secretary of state spokesman Andrew Cole told The Post Tuesday. Personhood USA founder Keith Mason said Tuesday supporters have a 30-day window to take legal action challenging Secretary of State Scott Gessler’s Aug. 29 determination that the Personhood Amendment failed to make the ballot — falling short by 3,859 signatures. We need your help! Last month we told you that volunteers worked tirelessly to collect over 112,000 signatures to get the Personhood Amendment on the ballot in Colorado. But the Secretary of State in Colorado has denied our request by claiming that we are 3,700 signatures short of qualifying for the ballot. This a purely political act, as many of the signatures discarded were actually valid signatures! They might win that legal challenge — or they might lose it. 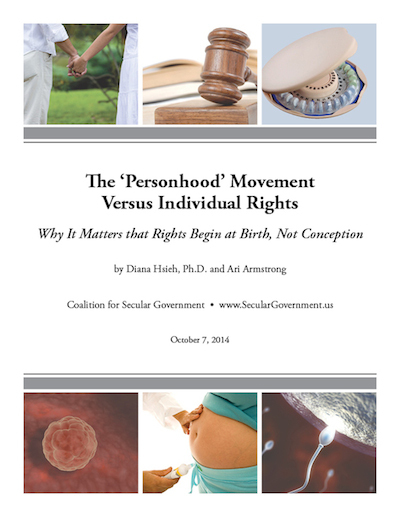 Basically, right now nobody knows whether “personhood” will be on the ballot in 2012 or not. That’s hugely frustrating for me. All plans to update Ari Armstrong’s and my 2010 policy paper The “Personhood” Movement Is Anti-Life are up in the air until this matter is resolved. Right now, I’m not sure what kind of revisions we’ll want to make, because we may want to talk about the new language of the 2012 ballot measure or not. Also, I don’t know whether I’ll want to raise money for those revisions or not, as I did in 2010. I’m not willing to slog through the burdens and risks of reporting again, as would be required if “personhood” makes the ballot, unless, that is, the court rules in our favor next week. In that case, I won’t have to report, even if “personhood” is on the ballot. That would be awesome. Gah! The uncertainty is just killing me. These matters will be resolved soon, I know, but time is running short! ALEXANDRIA, Va. – The Center for Competitive Politics’ (CCP) legal team filed a motion for preliminary injunction late last night on behalf of a Colorado group, Coalition for Secular Government (CSG). CCP asks that a federal judge in Colorado enjoin Colorado Secretary of State Scott Gessler refrain from forcing CSG to register as an “issue committee” until their constitutional claims can be heard. Otherwise, CSG will be unable to speak until a potentially lengthy litigation has run its course. Last month, CCP filed its lawsuit on behalf of CSG in the United States District Court for the District of Colorado, questioning whether Colorado can force small educational groups to register with the state before writing or publishing philosophical and policy analysis that mentions a state ballot initiative. The case stems from the efforts of Colorado resident Diana Hsieh. Hsieh, who holds a Ph.D. in philosophy, organized the non-profit CSG together with her friend Ari Armstrong in order to promote a secular understanding of individual rights, including freedom of conscience and the separation of church and state. Because of unconstitutionally vague state laws, confusion as to what constitutes political speech and what is covered under a press exemption, and a refusal by the state to abide by a federal court order, Hsieh and CSG have found it nearly impossible to carry out the activities of a small non-profit group without fear of running afoul of Colorado’s complex campaign finance laws. CCP Legal Director Allen Dickerson hopes the motion for injunction in the case will free the group from the administrative burden of registering as a political group, allowing them to speak freely until their case can be fully considered by the federal court. No hearing on the motion has yet been set. The Center for Competitive Politics promotes and defends the First Amendment’s protection of political rights of speech, assembly, and petition. It is the only organization dedicated solely to protecting First Amendment political rights. One of the invalidated rules said groups only had to file campaign finance reports if at least 30 percent of their spending was for or against a ballot issue. Elliff said the rule would have required issue committees with very little income, most of which is spent on election-related matters, to file reports while groups with huge budgets could spend big on election matters without having to file reports if the expenditures were less than 30 percent of their total spending. I didn’t like that 30% rule: it was poorly-constructed so as to disproportionately burden small groups. So I’m not sad to see that struck down, even though the result is that now we don’t have any clear guidance on what counts as the “major purpose” that triggers filing obligations for issue committees like CSG. That’s frustrating. I’m deeply unhappy that the rules capping fines have been struck down, as unlimited $50 per day per violation fines are downright obscene. What sane person is willing to wade through pages of confusing and complex campaign finance regulations and then attempt to file detailed reports on expenditures and contributions over $20 — with the threat of thousands upon thousands of dollars of fines for innocent errors looming over them? Re: “Gessler pushes rules rewrite,” Nov. 24 news story. I applaud Secretary of State Scott Gessler’s reforms of Colorado’s onerous campaign finance rules, despite his recent loss in court. As an occasional political activist, I know that Colorado’s campaign finance regulations are burdensome and intimidating. When Ari Armstrong and I wrote policy papers against the “personhood” amendments in 2008 and 2010, I was obliged to report $20 expenditures and contributions, as well as publish the names and addresses of our supporters. I couldn’t afford to hire lawyers or accountants. I struggled to understand and comply with the law, fearing fines of $50 per day per violation. The current rules strongly discourage ordinary people from speaking out on ballot measures, as the 10th Circuit Court of Appeals recognized. Gessler’s reforms, while limited, are an important step in the direction of greater freedom of speech. This letter was published in the Nov. 29 edition. I support free speech for everyone, not just for small-time activists but for large groups too. However, I am a small-time activist, and the law definitely burdens me disproportionately. As a matter of free speech, people should be able to support and assist other people to speak with their money, without having their private information posted for all the world to see. To say that “money isn’t speech” is wrong: money enables people to speak and to speak for others, and that is part and parcel of free speech. Otherwise, free speech means nothing more than my power to talk to my dogs while alone in my house. Ari Armstrong and I will discuss Colorado’s campaign finance laws on Wednesday, December 7th, at Liberty on the Rocks in Denver. I’ll post a full announcement of this event in a few days. Ari and I will also be speaking at the Thursday, December 15th, at the Secretary of State’s campaign finance reform hearing in Denver. You can find details about the meeting and the proposed rule changes in this PDF. I’ll post more about this hearing next week, but I’d very much appreciate anyone willing to attend the hearing in person to testify. If that’s not feasible, you can submit written testimony. For the Coalition for Secular Government, this election cycle is quickly becoming our busiest ever. The personhood movement is on the march, and to defend abortion rights, we need to defend our right to speak freely too. When I posted it to Facebook and Twitter, many people noted that they hoped that they’d never have to have an “oddtopisy.” But my favorite comment was posted by Roberto Sarrionandia to Facebook. This is hilarious. Presumably the same thing is true for all surgery. Paul can get away with strangling his patients, because radiography is legal and thus the authorities aren’t concerned with investigating it. Similarly, when people are stabbed, nobody bothers investigating because knives are legal.